Back in 2007, I was blown away by a handful of unexpected tracks that seemed to come immediately from the melodic Metal Heaven with an exceptional singer, all enveloped in a work of art beautiful cover. The name of that band was STORMZONE, hailing from Northern Ireland , the eleven songs were picked-out of a great album , with plenty of tasteful guitars and some slight AOR influences but, also and mostly embellished with a strong NWOBHM flavors and the disc was named "Caught In The Act", a title and a music style that brings back good memories of the golden era (PRAYING MANTIS / CLOVEN HOOF) and the beautiful Pterodactyl painted on the sleeve was signed by Rodney Matthews (ASIA / MAGNUM / NAZARETH / ALLEN-LANDE). I had the privilege of witnessing one of their shows at Firefest warming night, and the groups were musically pretty tight and really convincing. The singer was none other than the excellent ex-DEN OF THIEVES main man, Mr. John “Harv” Harbinson (ex-EMERALD / ex-SWEET SAVAGE) and I think that his huge vocal performance helped him on getting the job of frontman in the revamped but ephemeral line up of FASTWAY (with also John McManus on Bass). Unfortunately, when the second and the third album were published, I was disappointed and less enthusiastic, “Death Dealer” (2010) was a really let down, like if the band was neglected their Melodic impact or if the songwriting was suddenly weak, even the vocals by “Harv” Harbinson seemed to be less striking, unfocused and overstretched. 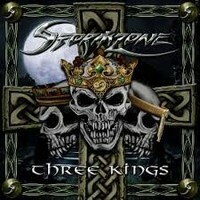 Today it’s a great day, because STORMZONE is back for good, with a new found dynamic, a fresh line up and again a bag full of headbangin’ melodic Metal tricks really impressive and infectious as much as "Caught In The Act" was back then, and maybe eventually heavier, indeed the brand new fourth album “Three Kings” is a strong return to their roots, but most of all to a song quality crafting process before anything else. The production is also much better and sounds like a million pounds creation, maybe they were financially supported correctly this time by their new record company ,after being dropped by SPV / Steamhammer, the band seems to have find a new shelter in the Metal Nation team, a relatively new label that was started by legendary ex-Neat Records / Edgy Records’ boss Jess Cox (ex-TYGERS OF PAN TANG’s vocalist) in 2004 dedicated mainly for the release of forgotten jewel primarily from the NWOBHM. The result is a solid album full of great cuts where the vocals takes the lion’s share, a great collection of well-crafted riffs that sounds like a profession of faith for the glory of Heavy Metal and the track "Bang Your Head” is possibly their new anthem. Utterly recommended.